Sunday, Apr, 8h: RSW18 Opening Conference. Monday, Apr 9th: Cacciatori di unicorni. 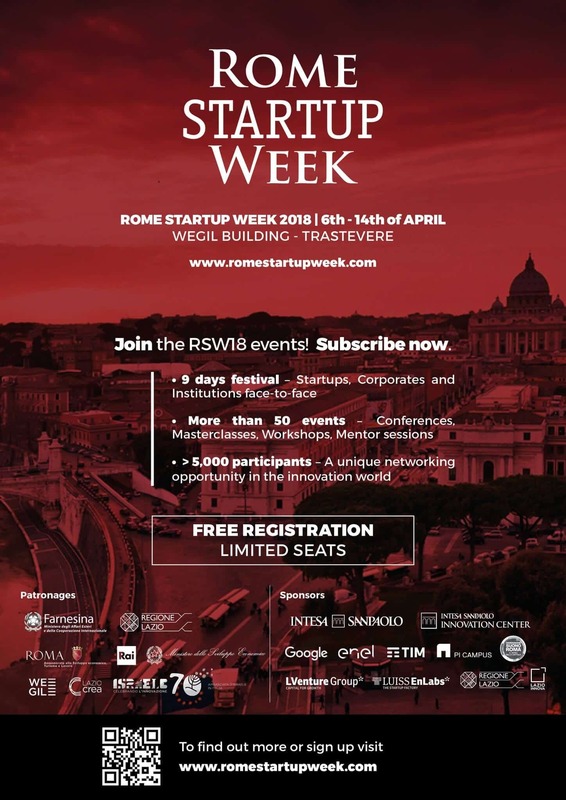 Our founder Marco Trombetti will talk about Why and How to Startup and tell its own experience both as an entrepreneur and an investor. Thursday, Apr 12th: Building Startup Ecosystem. Our venture partner Paolo Cellini will talk about the challenge of creating a venture culture in the EU. Friday, Apr 13th: Gladiator Challenge. Our founder Marco Trombetti will run a session with the startups taking part in the pitch challenge to suggest them How to pitch an investor. Saturday, Apr 14th: Gladiator Challenge Final. Our founder Gianluca Granero and our scout Valerio Lanni will be part of the jury who will award the best startup of the challenge. Please, note that all events have limited seats. You can register here to attend each event.